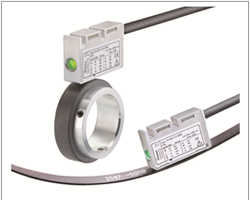 The bearing-free encoder system, from Kübler, with the Limes reading head and magnetic rings, as well as the linear measuring system with Limes reading head and magnetic bands, are non-contact systems, which have been specially developed for exacting environmental conditions and for installation conditions where space is tight. In addition to the standard IP67 measuring head the Limes family now offers a new sensor head specially designed for use outdoor use. This has a sturdy aluminum housing with a stainless-steel cover and protection levels of IP69k, IP68 and IP67. The special encapsulation technology provides excellent resistance to humidity. Special tests such as tested resistance to cyclic humidity according to EN60068-3-38 and to damp heat according to EN60068-3-78 substantiate this. Together with its wide temperature range and UV-resistant cable, the system offers the highest levels of reliability for all applications outdoors. The very compact system can be accommodated in the smallest installation spaces. Setup of the system is easy due to the large tolerances of up to 1 mm (this applies both to the distance between the band and the reading head as well as for lateral misalignment). A built-in red diagnostic LED indicates the index pulse or gives a warning if the tolerances are exceeded, in order to satisfy each application in the best way possible. The index pulse available on the magnetic band allows for fast re-determining of the position after a breakdown or maintenance. Rings and bands can be customized within a wide spectrum of different geometries to ensure perfect implementation into the application. On request reference signals can be incorporated or ready to be installed magnetic bands with installation kits can be supplied.